The public put its money where its mouth was during a public meeting last week about the future of the South Park Fairgrounds. Everyone in the audience was given $500 in fake money to play a kind of board game, placing the “money” on an element that the player thought was a priority. Elements receiving heavy play included removing Schoonmaker Hall, improving the oval fields/track surfaces and enhancing the park gateways. The input from this meeting, as well as another public meeting in September and focus groups and an online survey will be incorporated into a report from GAI Consultants, of Homestead, that is planned for completion at month’s end. The study is supported by the Richard King Mellon Foundation, the Heinz Endowments and the county. While there is no money in hand for improvements, the county is more likely to receive funding from foundations, and the state and federal governments, if a plan is in place, said county parks director Andy Baechle. There is no timetable. The process was set in motion through a master plan created several years ago for all nine county parks. One of its recommendations was the formation of a nonprofit parks foundation to which tax-deductible donations could be made. That done, the master plan was again addressed, such as its call for a detailed vision of the 76 county-owned acres from Corrigan Drive to McCorkle Road encompassing the Fairgrounds, exhibit hall buildings, amphitheater, police barracks, Nature Center, tennis/basketball courts, and more. “This area has a tons of potential, but it has lagged,” said Jeaneen Zappa, the Allegheny County’s sustainability manager. At the meeting, three options — titled “Modified,” “Campus” and “Picturesque” — were presented to solicit comments from the audience. The “Modified” option is based on what can be done fairly easily and economically, such as removing/repairing bleachers, improving oval fields/track surfaces and enhancing park gateways. With “Campus,” which emphasizes pedestrians, the recommendations include removing Agricultural Hall for additional parking, adding a “green” parking lot at McCorkle and Brownsville roads and reclaiming the southern end of Catfish Run. “Picturesque” focuses on the naturalistic quality of the park’s original planning, such as reconfiguring the oval track to curvilinear shape, relocating the tennis/basketball courts and relocating the nature center adjacent to Catfish Run. Christine Fuller, executive director of the Allegheny County Parks Foundation, said the organization will review the final report and work with the county on the next steps. After the meeting, Jeff Danchik, director of the Mon Valley Express, a drum and bugle corps which leases space from the county at Brownsville Road and Corrigan Drive, said the area needs more attractions, such as a craft shows or flea markets. “A lot of people don’t know we’re here,” Mr. Danchik said. Walt Sackinsky of South Park said he would like to see the infrastructure addressed, such as aging water, gas, and sewer lines, and fire hydrants. For Terry Tressler of South Park, priorities include improvements to Corrigan Drive such as adding a middle turning lane with room on each side of the road for walkers and bikers. His wife, Donna Tressler, would like to see Schoonmaker Hall, which is used for storage, razed. “It is falling down and dangerous, with kids going in and out,” she said. A big priority for both is improving the bathrooms. The couple, lifetime park users, are hopeful for change after attending both public meetings. “I’m impressed with the caliber of people who seem to want to improve the park,” he said. A cluster of former fairground buildings along Brownsville Road in South Park could get a green makeover, under three plans officials presented Wednesday night as part of Allegheny County’s effort to revitalize the park. Titled the “modified,” “campus” and “picturesque” concept plans, each offers an increasing degree of replacing parking lots, roads and rundown halls with green space and walking paths, said Todd Brant, project manager for Homestead-based GAI Consultants. “The fairground is unique in this large concentration of buildings, but it’s not as park-like as the rest of the park,” he said. The campus plan would go slightly greener by moving more parking near McCorkle Road, cutting out sections of access roads and demolishing a few more of the old fair buildings. The picturesque concept would go furthest by removing the oval track and replacing it with a more meandering walking trail. The bleachers, tennis and basketball courts would be removed and replaced with trees, and the concrete channel for Catfish Run would be removed for a more natural-looking stream. County Parks Director Andy Baechle emphasized that the plans, which won’t be finalized until the end of the year, will only be a guide until funding to make the changes is found. The plans will be posted online today and public surveys can be taken until Sunday at alleghenycounty.us/parks/SPFairgrounds. 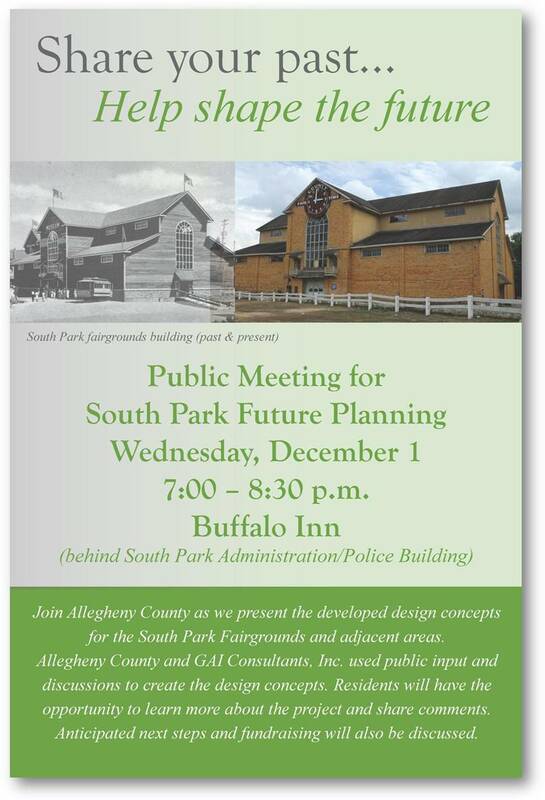 Allegheny County officials will show off plans for upgrading the South Park Fairgrounds and surrounding areas Wednesday, after months of meetings and public input on what to do with the aging site of the defunct county fair. Three plans center around improving pedestrian connections to the 80-acre site; aggressive maintenance of buildings; “greening” the grounds with vegetation and less pavement; returning nearby Catfish Run to a more natural state; and remaking the field and track next to the fairground buildings, said Jeaneen Zappa, county sustainability manager. Each plan will tackle those goals with differing degrees of intensity, but none of the changes is intended to be drastic. Catfish Run, which flows through a pipe beneath the fairgrounds and a culvert between the track and an access road, could be restored to natural banks with vegetation. The Nature Center, located in the middle of “an island of asphalt,” could be moved to a fairground building closer to the stream and the head of several park trails, Zappa said. Vehicular traffic through and around the site could be rearranged so that it is less redundant and confusing, she said. Though county officials don’t have specific plans for the fairground buildings, many people who spoke during a public hearing in September want the county to rent more buildings to community groups. During the past two months, teams from Homestead-based GAI Consultants gathered ideas from people about what they’d like the county to do with the fairgrounds and parts of the surrounding park. Online surveys are available at alleghenycounty.us/parks/SPFairgrounds. The meeting will be held from 7 to 8:30 p.m. in the Buffalo Inn, off Buffalo Drive near the intersection of Brownsville Road and Corrigan Drive. Many small towns have rich stories, but few tell them as well as Vandergrift. Part of that tale is in the layout of the historic area of the 115-year-old town. Designed by the firm of Frederick Law Olmsted, the creator of New York City’s Central Park and many academic campuses, the streets arch over and around the hillside on which the town is built. A grand theater, the Casino, sits facing a mall leading down to a train station. It was given that spot intentionally to offer a welcome to anyone arriving in the Westmoreland County town. The town was built to provide a home for workers at the steel mill of George McMurtry. The mill has had six owners since its first, but still is working, despite the decline of the steel industry. All of those features make Vandergrift a place where the past is a major part of the present. It makes it worth a visit to see that story. The Victorian Vandergrift Museum is in a school built in 1911 and, like many features of the town, is a work in progress. With displays on three floors, it tells the story of the town in a number of ways. On the bottom floor is a room decorated with many pictures of initial work on the town along with map of the plans originated by the Olmsted firm. If you’re lucky, you might run into Bill Hesketh, treasurer of the museum and historical society. He could tell you about McMurtry, owner of Apollo Iron & Steel, wanting to build a town that would attract workers and entice them to stay. He would do that by having the famed designers draw up a plan for the ultimate company town. McMurtry thought a cultured worker was a good worker, so included plans for the Casino. He also saw the benefit of religious life, so provided $7,500 to any congregation planning to build a church costing $15,000 or more. He wanted sober workers, so the town was dry until 1936. If you are lucky, Hesketh will be there to offer you some thoughts. But it will take some luck. He does not schedule tours or times he is there for visits. There are no other guides at the museum either. But simply wandering around the museum will provide a look at what Vandergrift is all about. Victorian Vandergrift Museum, 184 Sherman Ave. Hours: 10 a.m. to 3 p.m. Mondays to Saturdays. Details: 724-568-1990. Now, it’s time to take to the streets. In some ways, the rows of houses are the story of Vandergrift. The look of the town is somewhat defined by the rows of company homes on streets that are devoid of 90-degree angles. When the Olmsted designers laid out the plan, Hesketh says, they decided on 50-feet-wide lots, but McMurtry thought that was way too wide. He was selling the lots, and wanted to profit from them. They became 25-feet-wide, leading to streets of homes generally built tightly together. Hesketh points out some people eventually bought two homes and built them together to make one bigger residence. Or they bought one and tore it down to create a bigger yard. There are some properties that were sold as 50-feet-wide and are the sites of some nicer homes, for the non-laborer class. Take a walk around and look at the history of a town as seen in its homes. The look of the town is created by the past and the gentle curves of the Olmsted design, which even creates a non-straight business district. After touring Vandergrift and getting ready for the finale of this day, it is time for dinner. There are some likely stops for a meal in town, and these three win local praise. You probably saw them as you wandered around. The G&G Restaurant (724-567-6139) on Columbia Avenue is largely a breakfast and lunch place, but is open till 9 p.m. for dinner. A.J.’s Restaurant (724-568-2464) is open Tuesdays, Wednesdays, Thursdays and Saturdays until 10 p.m. and 11 p.m. Fridays. Offering a more specific dinner outlook is the Steeltown Smokehouse (724-568-4087) on Washington Avenue. The burgers-and-wings emporium is open till 8 p.m. Mondays to Thursday, 9 p.m. Fridays and Saturdays and 6 p.m. Sundays. The best way to do this trip is to pay attention to the shows at the Casino, which can be checked out at www.casinotheater.org, then plan a visit on a day ending with some entertainment. Make sure to arrive at the Casino with enough time to look around. The oldest, active theater in Western Pennsylvania had become a unused shell when a group that became Casino Theatre & Restoration Management took it over in 1991, Hesketh says. They brought the site back to life. Trumpet star Maynard Ferguson (1928-2006) performed there along with the Vogues and the Clarks. The renovated theater has been the home of stage presentations. Some of the restoration meant changes from the original, Hesketh says, but some of that provided aspects that seemed to be needed. “This place just called for boxes,” he says, pointing to box seats on each side of the stage. Roam around the Casino. The balcony casts a good and attractive view of the stage. The lobby, slightly smaller than what it once was, offers an attractive entrance. McMurtry thought the Casino would be a significant part of the town when it was built in 1900. Also on display is the garden railroad with operating trains and miniature living scenery that includes dwarf conifers. The show, which runs through Jan. 9, was designed by the conservatory staff with help from Michele McCann. “The show is a wonderful combination of horticulture and whimsy, with beautiful new poinsettias and common annuals used in unusual ways,” says Margie Radebaugh, Phipps’ director of horticulture and education. • Visits by Santa Claus on Saturdays and Sundays through Dec. 19. • A “Garlands & Gifts” sale on Dec. 2-3 from 10 a.m. until 7 p.m.
• Phipps stays open until 10 p.m. daily, beginning Dec. 6, with candlelit walkways and live entertainment. Admission is $12 for adults; $11 for seniors 62 and older and students with valid ID; $9 for children ages 2 to 18; free for children under 2. Information: www.phippsconservatory.org or 412-622-6914.